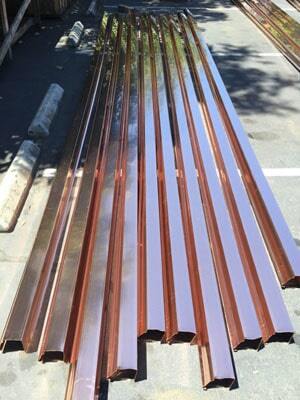 Kobett Metals offers an onsite gutter extrusion service, commonly known as “chop and drop”. We have portable gutter extrusion machines for 4″ OG, 5″ OG, 6″ OG, 7″ OG, 5 1/4″ plain fascia, single bead fascia, double bead fascia, curved fascia and 1″ ribbon band fascia. We also offer a deep 7 1/4″ double bead fascia. We will transport our portable gutter machines to your house or onsite project and extrude a beautiful seamless copper gutter up to 50 lineal feet (one piece). Our territory includes the greater Bay Area, as far south as the Monterey Bay, as far north as Santa Rosa, and as far east as Sacramento. Pricing varies slightly based on the location and size of the project. There is a great deal of savings that can be realized in seamless gutters, in part because there are no wasted pieces. We’ll be happy to provide you with gutter samples for your inspection before ordering our services.